You are here: Home > News > Application Submitted for Phase 1: Belfast’s Cathedral Quarter. What characterises this type of application is its confusion, with the mix of previously approved components and new sections intermingled to the point that neither the public nor the BCC planning committee can easily assess the actual impact on the authentic historic Belfast. With the process of Pre Application discussions between developers and planning staff largely hidden, and ultimately presenting what are effectively ‘fait accompli’ applications heavily promoted by developers’ PR consultants, the difficulties for Planning Committee, Councillors and the general public, multiply. A process designed to smooth the operation of planning, now seems less like planning and more like facilitation. Effectively the public and councillors appear relegated to the role of rubber stamping approvals. 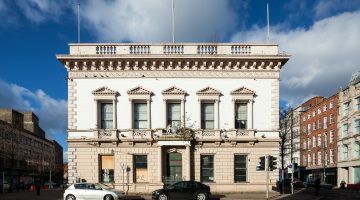 UAHS is particularly concerned with proposals for alteration to important listed buildings, proposed at ‘pre-application’, that were in fact already approved by Belfast City Council in January 2017. These approved applications relate to Masonic Halls, Central Halls, affecting the setting of Rosemary Street Presbyterian Church. Why did plans for these important buildings, integral parts to a widely acknowledged larger scheme, process piecemeal through the planning system? Does the inclusion of these proposals in pre-application consultation imply that these proposals are open for complete reconsideration as part of the current application? Not to mention wider issues around the affect that this development would if approved have on Belfast’s historic core. The process by which this application is handled perpetuates Belfast’s complete lack of a coherent plan to enhance the City’s Unique Selling Points with quality architecture in scale with the City’s historic asset base. Instead we are offered more overbearing and mediocre blocks looming over some of Belfast’s best remaining buildings, some reduced to facades, some altered extensively and detrimentally and with others simply erased from the streetscape. Belfast’s built heritage deserves better than this. TAKE ACTION: Respond to application Reference: LA04/2017/2126/F. Full details can be found here. Email response can be sent to [email protected]. Other relevant applications include: Masonic Hall, 15 Rosemary Street, BT1 1QA- LA04/2017/2082/LBC and LA04/2017/1448/LBC; Rosemary Street Presbyterian Church- LA04/2017/2081/LBC; and Central Hall, 37-39 Rosemary Street- LA04/2017/2120/LBC and LA04/2017/2196/DCA.